As an Oriental Energy Corporation Ltd (Oriental Energy) company, Ningbo Fortune Petrochemical Corporation Ltd (Ningbo Fortune) selected the US-based UOP-Honeywell technology for a greenfield project to produce propylene at the port of Ningbo, in the Zhejiang Province, China. Previously named Zhangjiagang Oriental Energy, the company became Oriental Energy in 2009 and established its headquarter in Nanjing in the Jiangsu Province of China. Oriental Energy main activities rely on import, storage and distribution of liquid petroleum gas (LPG) for the petrochemical industry. Historically Oriental Energy is a trading company which manages storage facilities to support its international activities with hydrocarbon products such as methanol, propane, butane, propanol, butylalcohol, toluene, dimethylbenzene, paraxylene, and other bulk chemical products. In 2012, Oriental Energy and its partners Jiangsu Feixang Chemical (Feixang Chemical) and Jiangsu Huachang Chemical (Huachang Chemical) had already selected the UOP-Honeywell technology for the Zhangjiagang Yangtz River Petrochemical (Zhangjiagang Yangtz River) project. Branded as C3 Oleflex process, this UOP-Honeywell technology is designed to convert propane into propylene. Providing high catalytic performances, this C3 Oleflex process has been adopted by Oriental Energy as it generates low catalytic pollution in addition to its high yields. Then Zhangjiagang Yangtz River selected the Dow Unipol technology for the production of polypropylene. With these licenses Zhangjiagang Yangtz River is starting the construction of its first Jiangsu propane dehydrogenation (PDH) plant. Willing to take advantage of the emerging shale gas production in China as operator with 56% share, Oriental Energy has sized its Zhangjiagang Yangtz River PDH first phase at 600,000 tonnes per year (t/y) of propylene to feed its future polypropylene (PP) expansion. In the same time as it starts the construction of the Zhanjiagang Yangtz River PDH project, Oriental Energy is taking a leap in processing bulk chemicals with the Ningbo Fortune project. 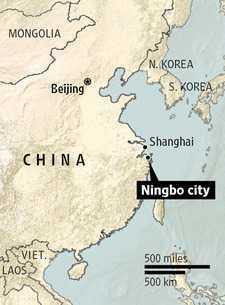 Ningbo Fortune is wholly-owned by Oriental Energy ans is planning to develop a petrochemical complex in Ningbo, along the existing storage facilities in the Ningbo Daxie Development Park. The PDH units should have a capacity of 660,000 t/y of propylene each while the downstream polypropylene plant should have a capacity of 400,000 t/y. For the polypropylene, Oriental Energy selected the Ineos Innoven technology. – Phase 2 should see the addition of the second PDH unit. While selecting UOP-Honeywell and Ineos, Oriental Energy accommodates site location to host Ningbo Fortune propane conversion project due to come on stream by 2016.